My Bearly Teddy Bear is hand made in the finest brown cuddly soft plush. My Bearly Teddy bear is 28 cm tall. He is made of soft, fluffy plush fabric and created with great care and attention to detail. His light brown paws and soles give him the brown look of a bear. He features an embroidered nose and mouth. He has a customised identification tag on his neck in the shape and design of a paw prints. 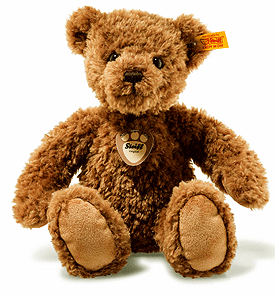 This cute Teddy bear is delivered with a tiny birth certificate in a paw design. My Bearly Teddy bear is provided with information on his place and date of birth, making him a wonderful gift and lasting memory.